Congratulations to the newly certified puukkoseppämestari; Tapio Syrjälä, Eero Kovanen, Jari Liukko and Mikko Inkeroinen. They are the first new master bladesmiths confirmed since 2009. 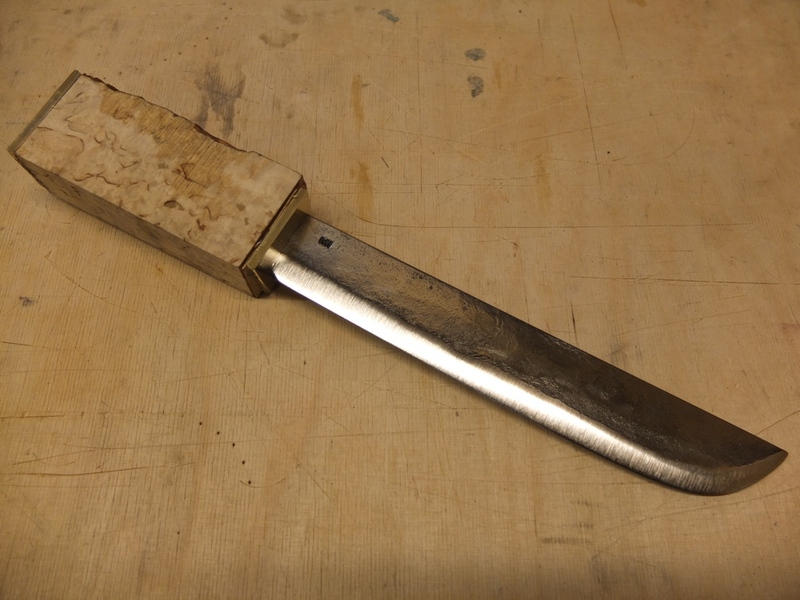 They had two years to prepare for the final exam, making two knives for the jury. One a “user” and the other one a collector grade piece. 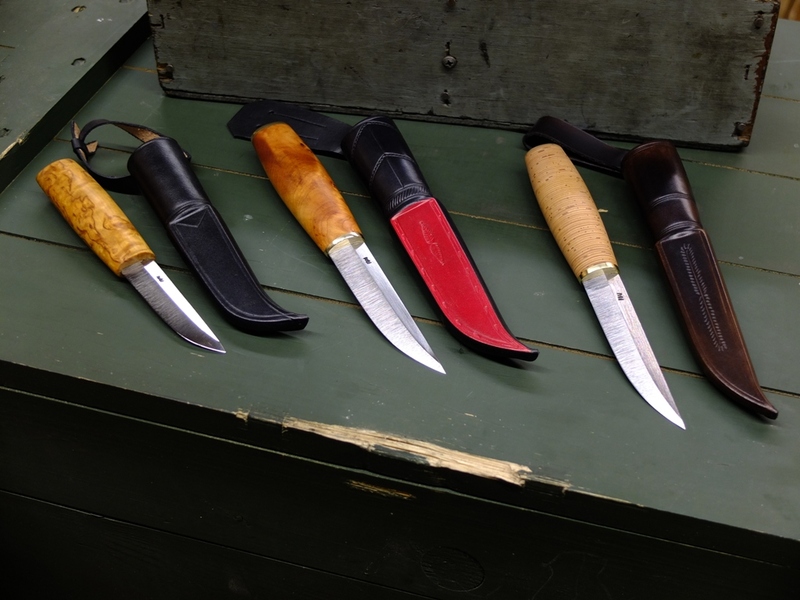 They join the seven other puukkoseppämestari; Pekka Tuominen, Jukka Hankala, JT Pälikkö, Arto Liukko, Markku Vippola, Mikko Haverinen, Pasi Jaakonaho as master bladesmiths certified by the Finnish National Agency for Education. Each of the four has been featured on this blog, please check the Index Page to learn more about them and their work. Again congratulations on your achievement! 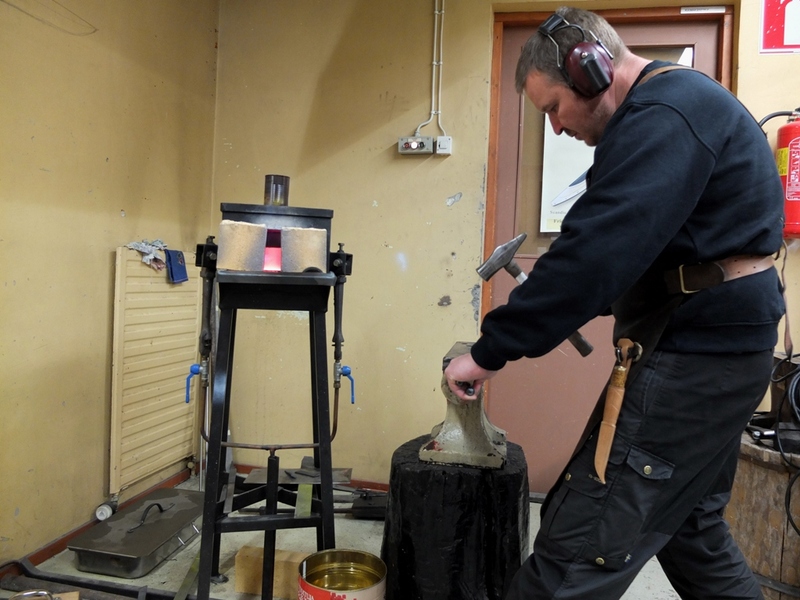 Mikko Inkeroinen is a puukkoseppä and black smith from Mikkeli, Finland. 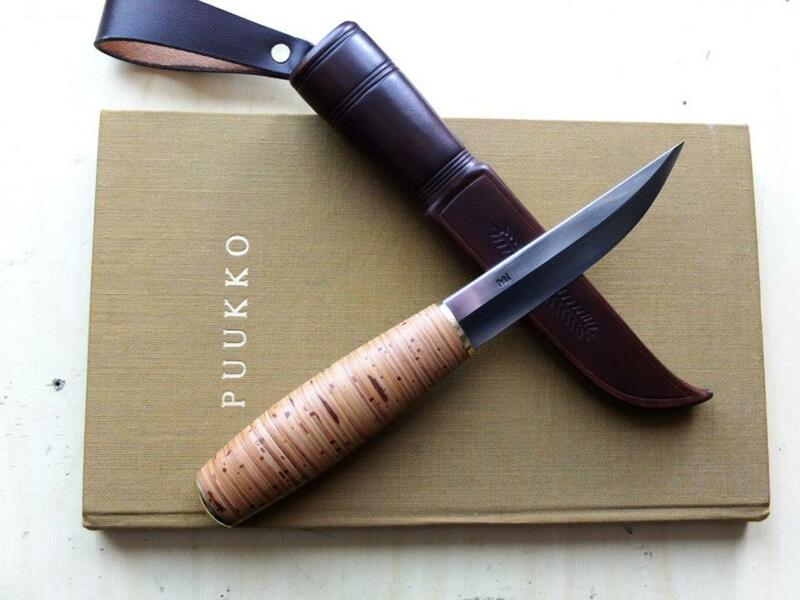 Mikko’s puukkos caught my eye early on when I first became interested in Finnish knives. His work is based on traditional forms using the age old materials and methods. 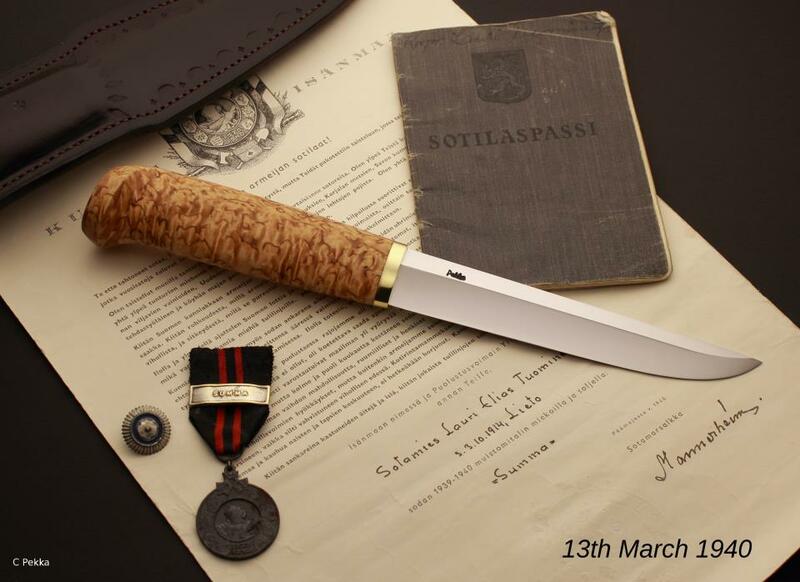 Mikko has said ” I think my mission is to show people that tools can be also beautiful.” I think he captures the essence of what the Finnish knife can be and does exactly that. 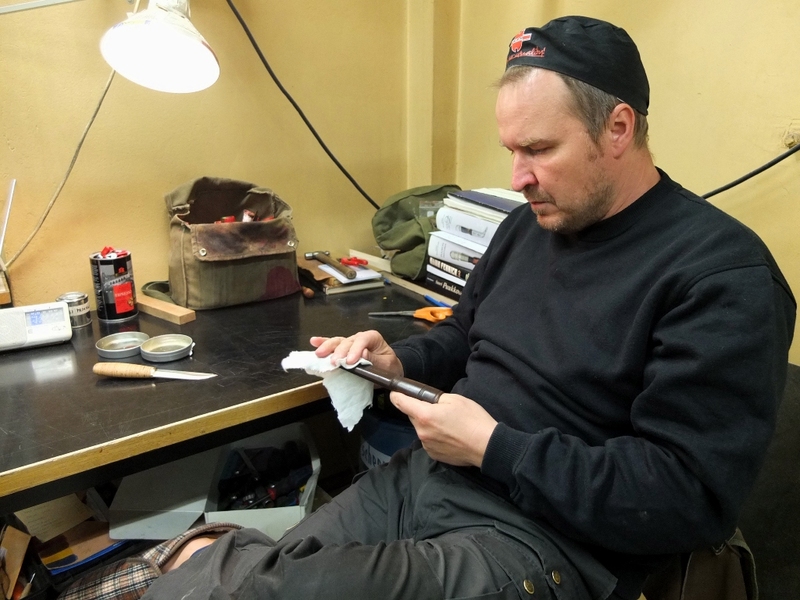 Mikko also does all kinds of black smithing and his work can be seen at his website http://seppainkeroinen.net/ Thank you Mikko! 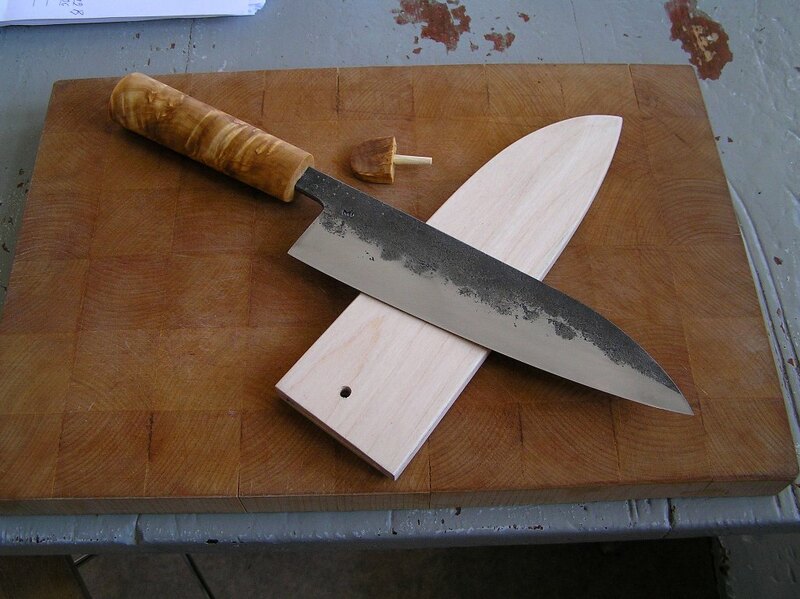 “I first got interested in knives when I saw my father’s collection of puukkos. 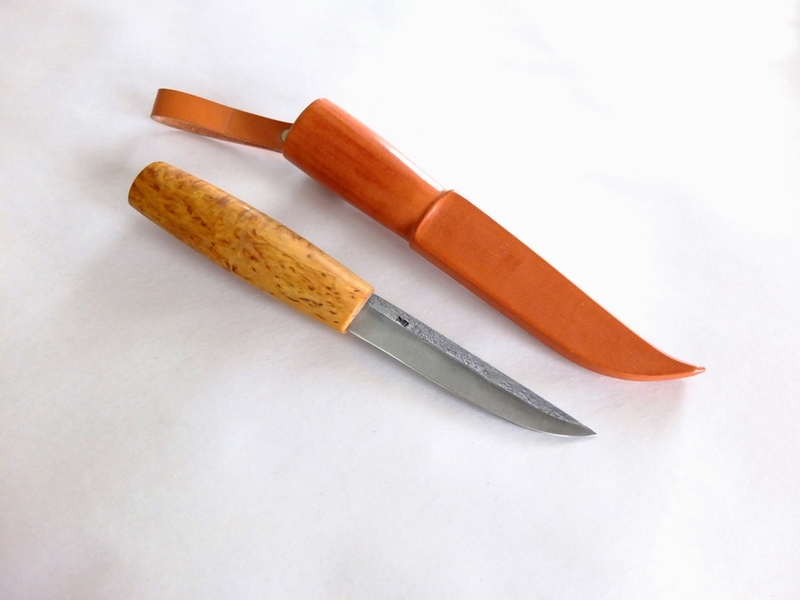 When I was young boy I used puukkos often for wood carving and I made my first one in 1997. 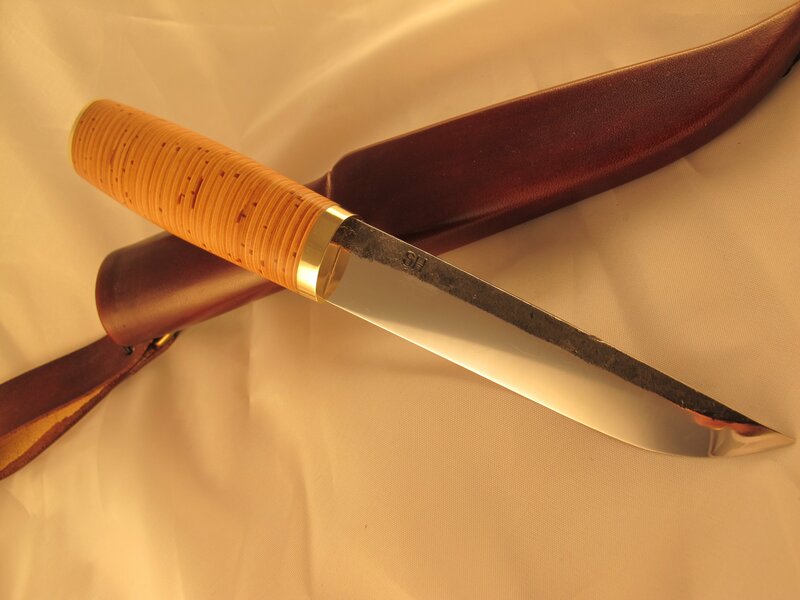 I´m the first bladesmith in my family and in the beginning I was self-taught. 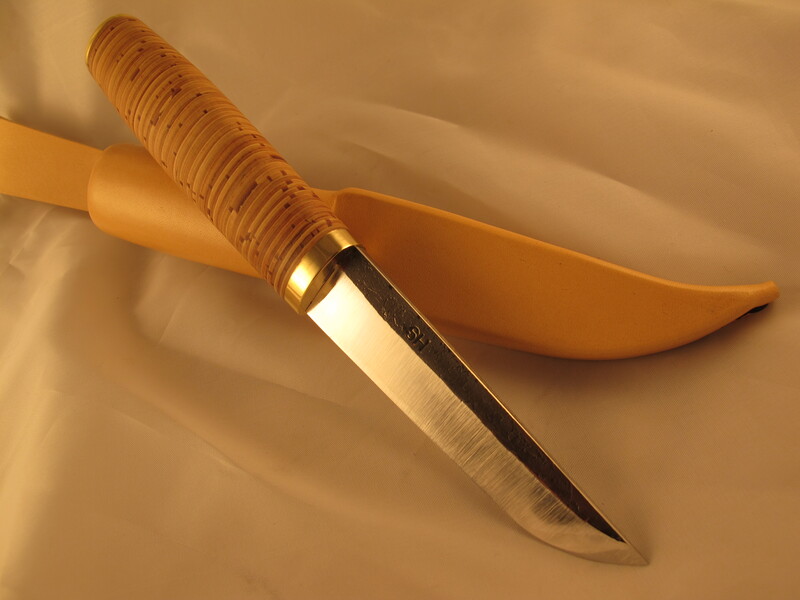 Soon after, though, I got advice about puukkos, the most important ones of which I got from Olavi Kemppainen, the master of Tommi-puukko from Kuhmo, Finland. Then I studied and graduated as metal-artisan. 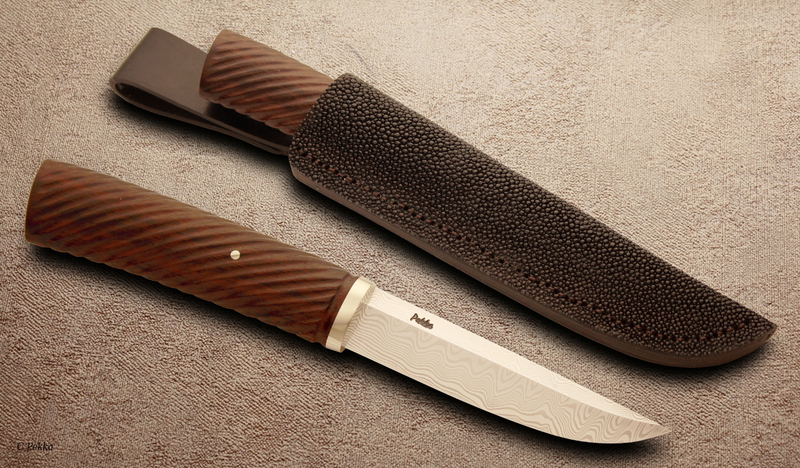 Additionally my damascus master is Jean-Jose Tritz from Hamburg, Germany. 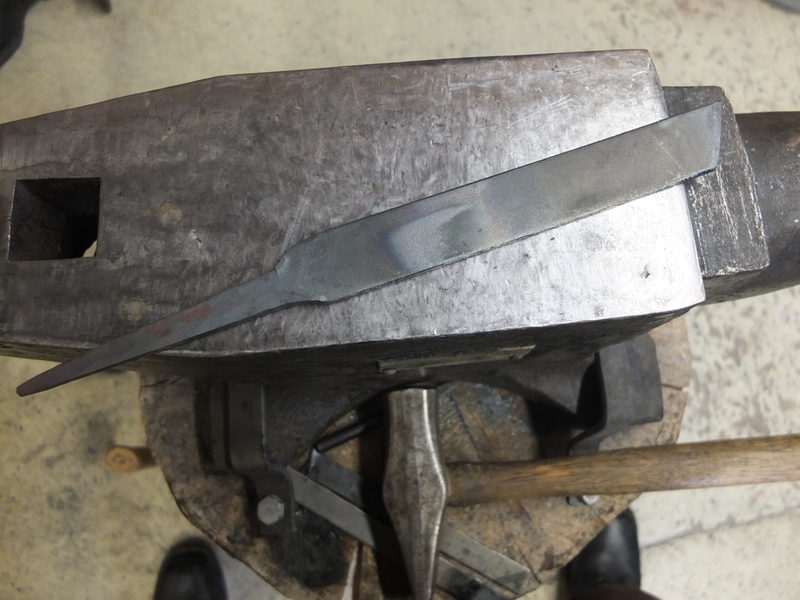 I am also a bladesmith journeyman. 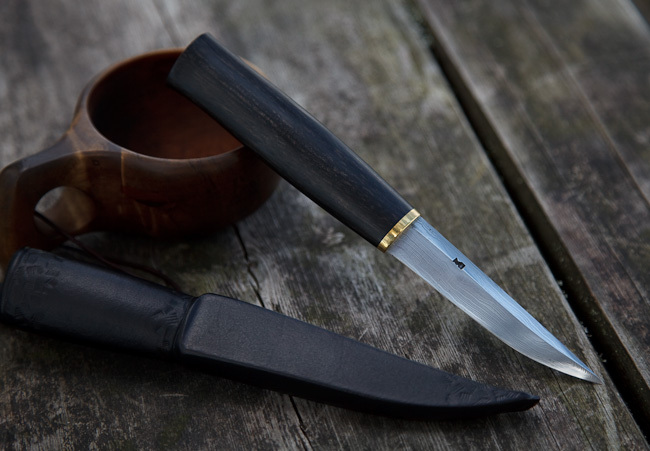 In my area black smithing tradition is really primitive: typically agricultural tools; on the other hand Finnish puukko culture is powerful and very old. The most important things in my works are beauty and usability. Typically my products have clean lines and simple design. My inspiration comes from the old and powerful culture and only a little from the new fashion. 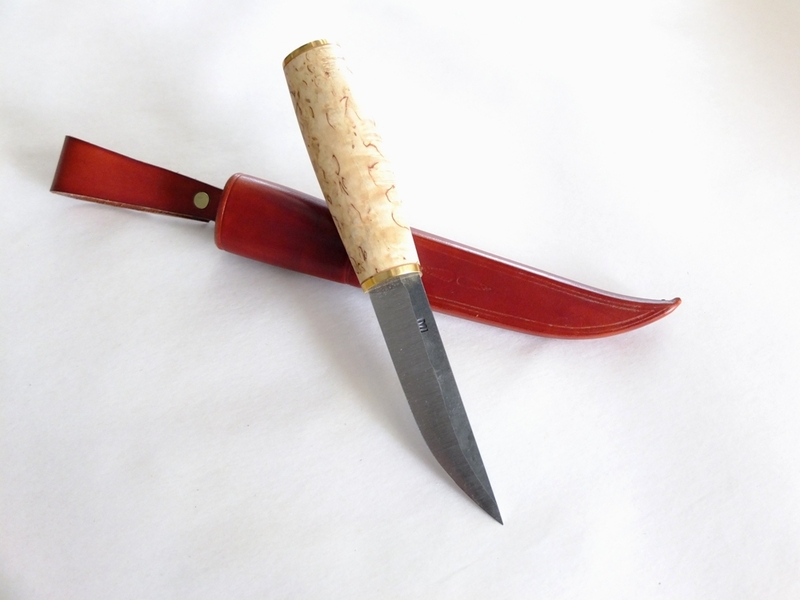 The leuku is a traditional knife of the Sami culture of Lapland, it is also called “stuorra niibi” which means big knife. 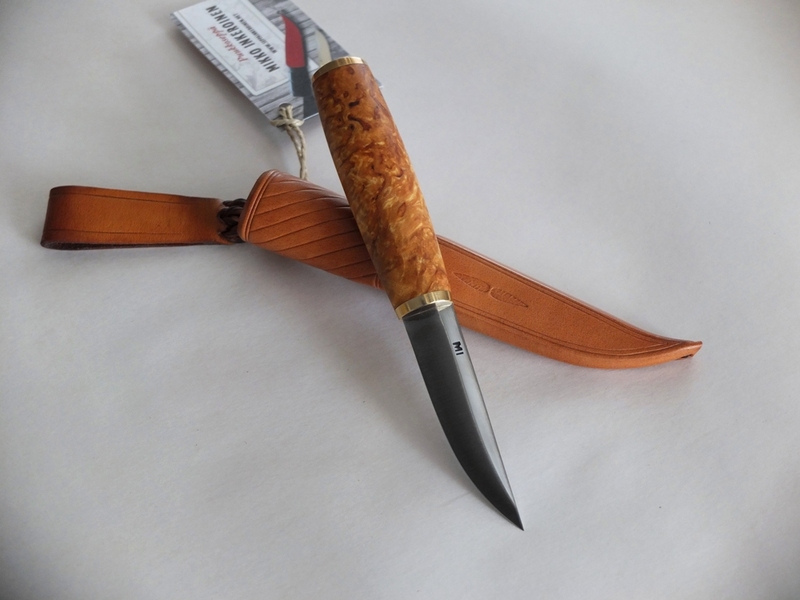 I will be making two posts about the leuku, the first one with a brief description, some photos and an account of his experience with the leuku by Thomas (edgepal) from Northern Sweden. The second post is an excellent essay written by Pasi Hurttila, a puukkoseppä from Ivalo, Finland. 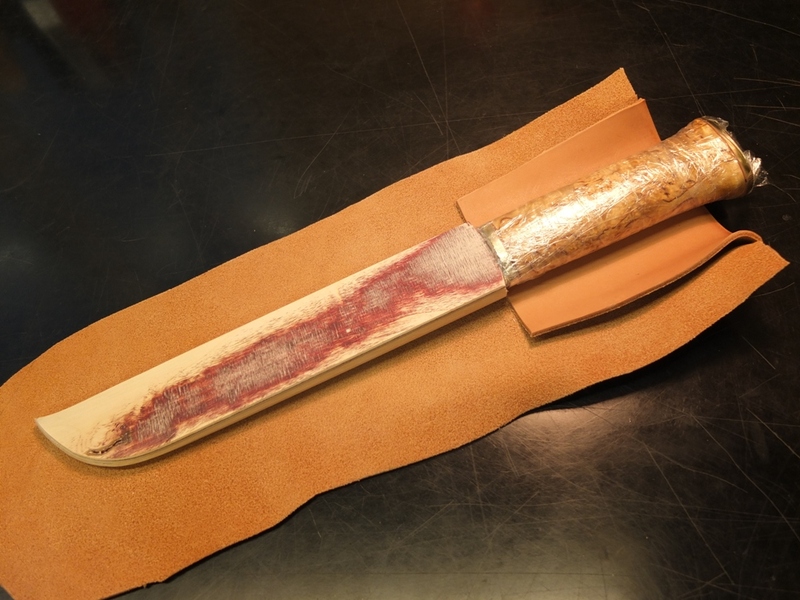 In my correspondence with Federico Buldrini he states “It’s believed that leukus were developed by Sami people, starting from the Viking seaxes and väkipuukkos (in Finland). 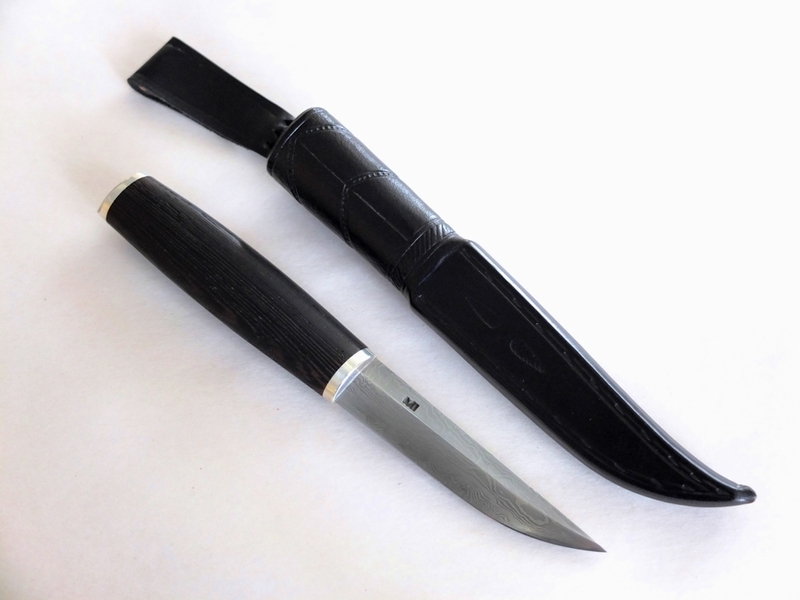 These knives, together with steel working techniques, arrived in Scandinavian and Baltic peninsula after the Migration Period, 400-700 A.D.” and the leuku has evolved to suit their needs, from chopping down small trees, clearing brush and splitting firewood to butchering and preparing reindeer. 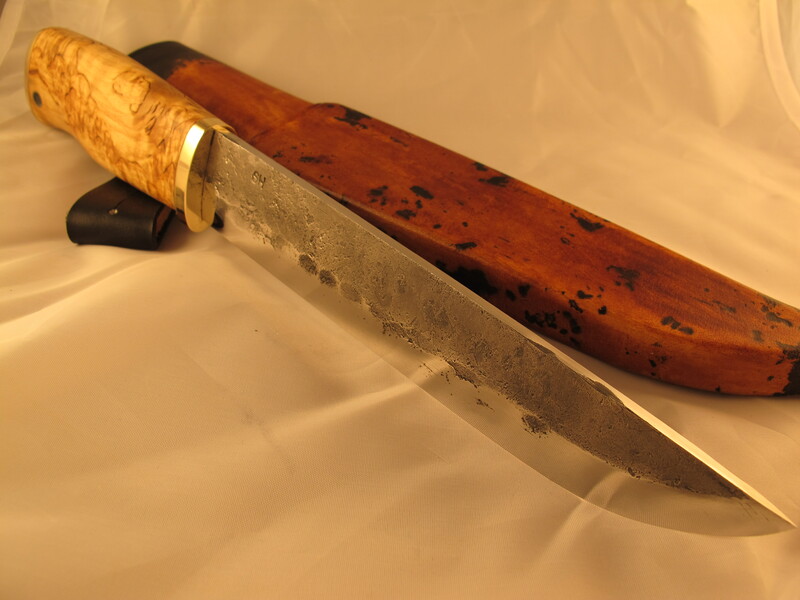 The leuku has a wide blade about 8 or 9 inches long usually of carbon steel which holds up better in the cold climate. 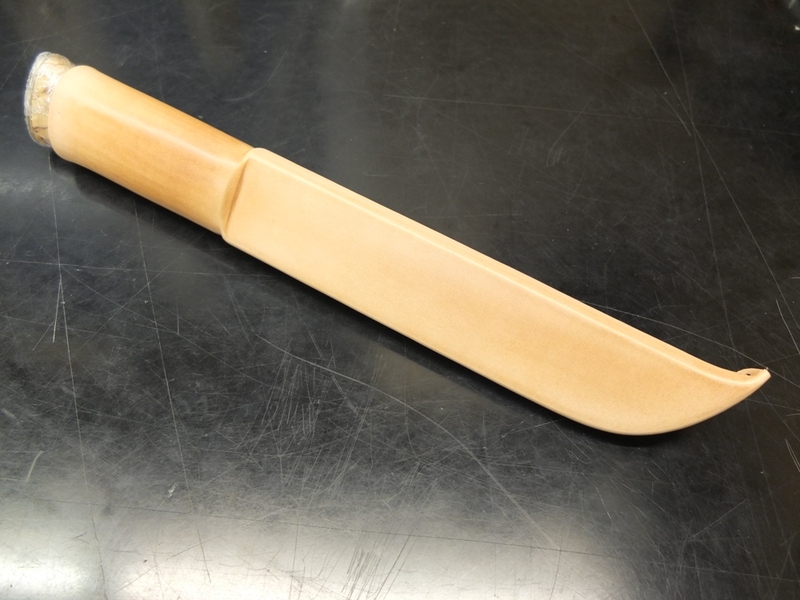 The handle is generally birch with a wide flat pommel at the end that gives added force when struck with the free hand. 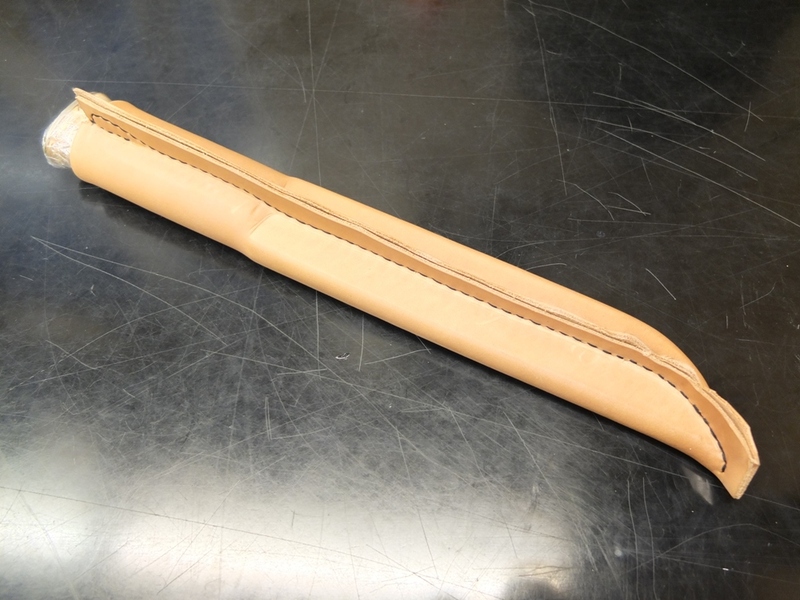 It also helps in taking the leuku out of the sheath with gloves or mittens on. 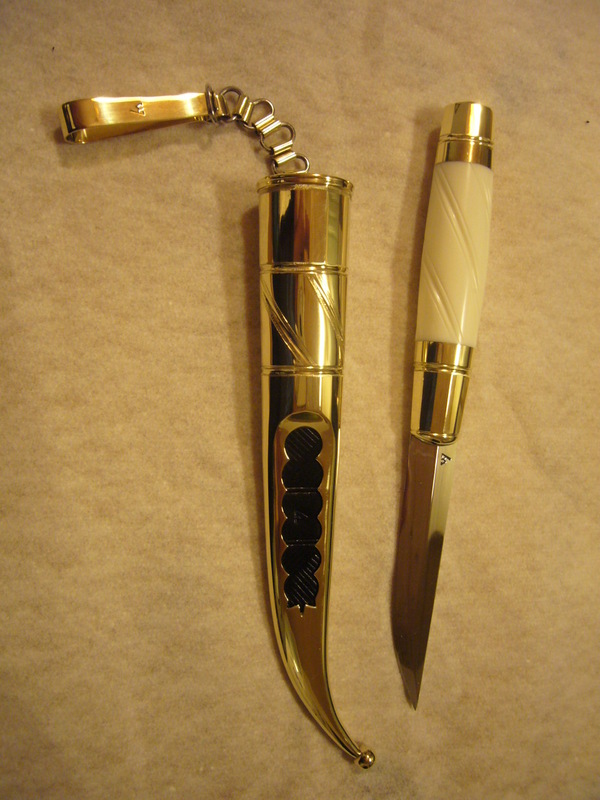 Sometimes a small piece of bone may be inserted in the handle as a rattle, a measure to keep evil spirits away. 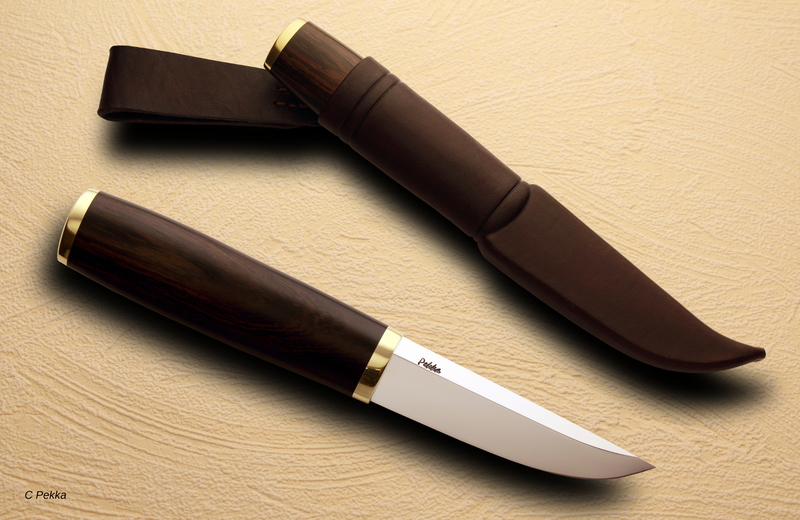 The bolsters are brass and the tang extends all the way through the handle. 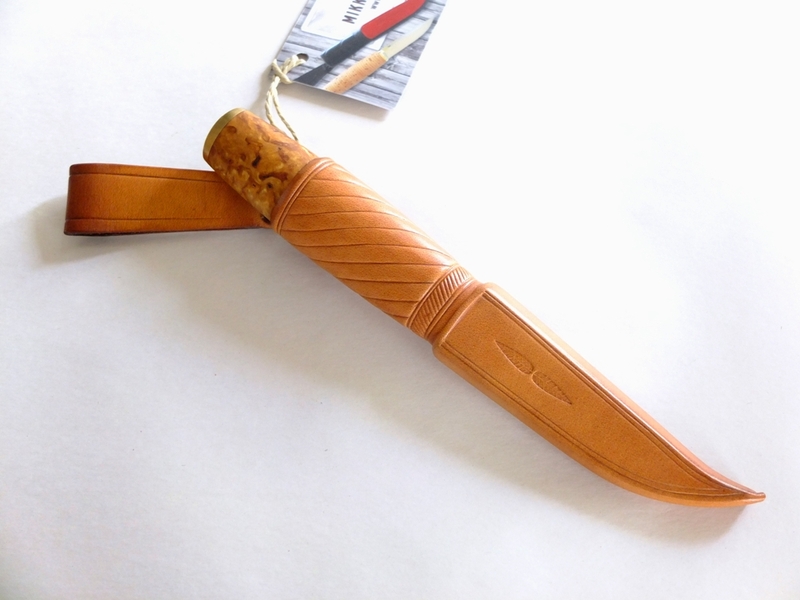 The tuppi or sheath is leather, usually from reindeer and is very deep covering almost all of the knife. 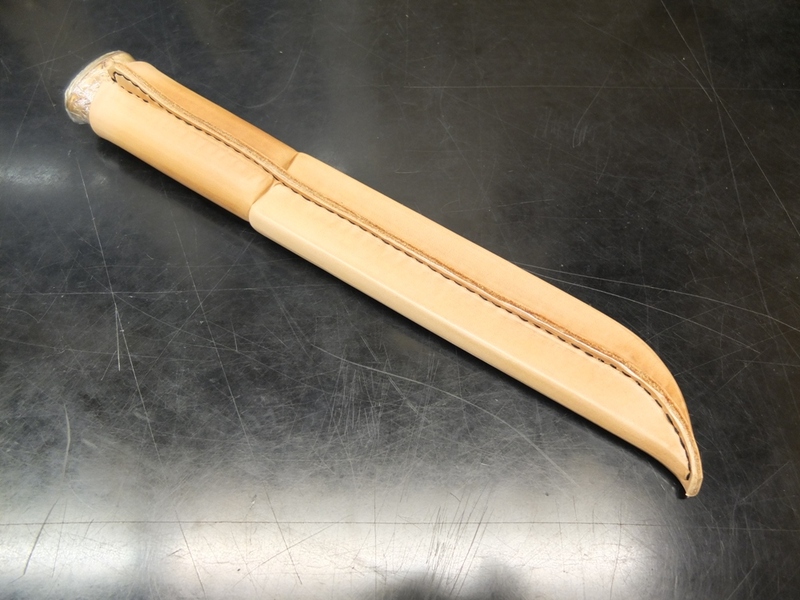 There may be simple decoration on the sheath. 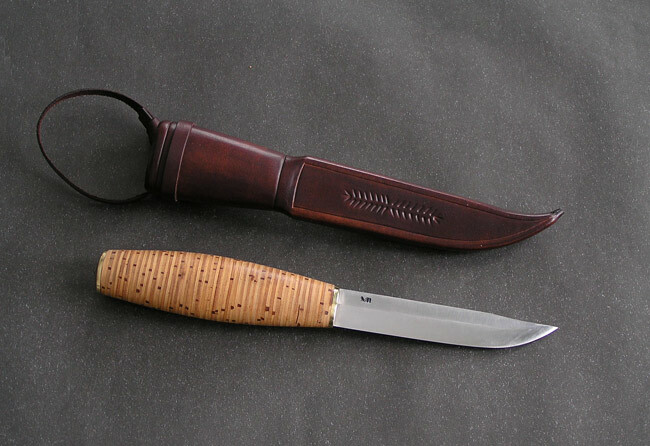 The leuku is a multi purpose tool. 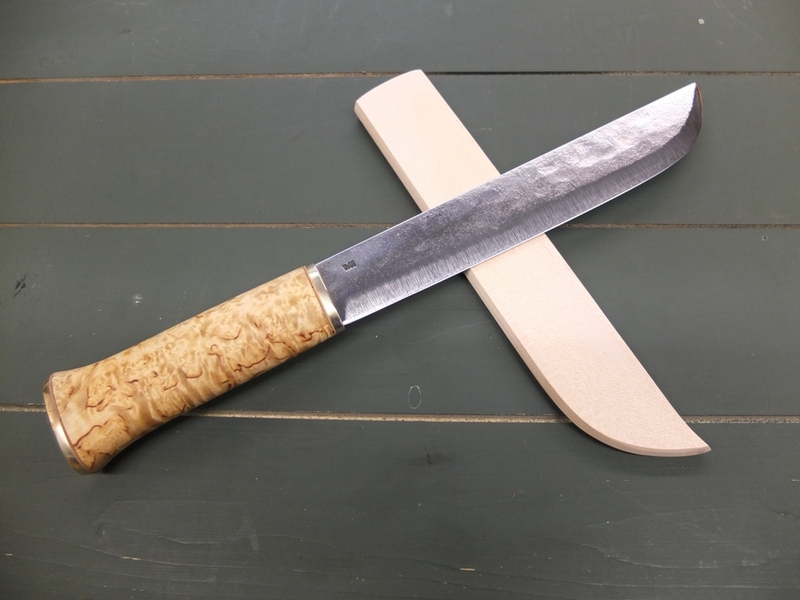 There are several smiths making leukus and they are available from some of the manufacturers of Nordic knives such as Strømeng http://www.samekniv.no/index.php?option=com_content&task=blogcategory&id=52&Itemid=67. 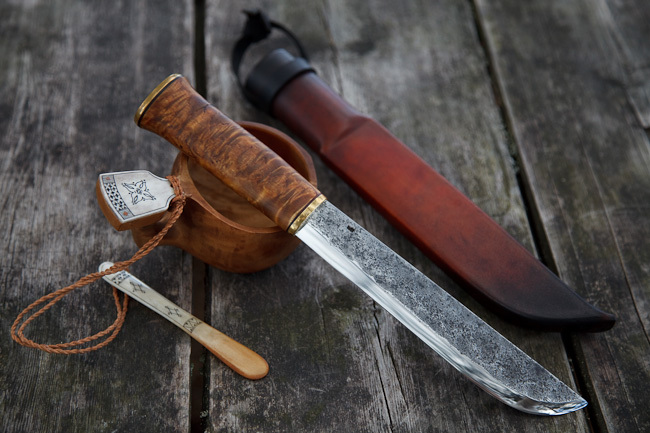 They are popular for use among those who like to hike and camp in the forests, “bushcrafting” as well as the reindeer herders. “I lived with the Sami people for 20 years in the high Mountains (alps) of Sweden. My wife was Sami and her parents and 6 brothers were living the traditional Sami life and life style. I lived in the mountains with her relatives for 6 months every year and two of my three sons work with reindeer today. 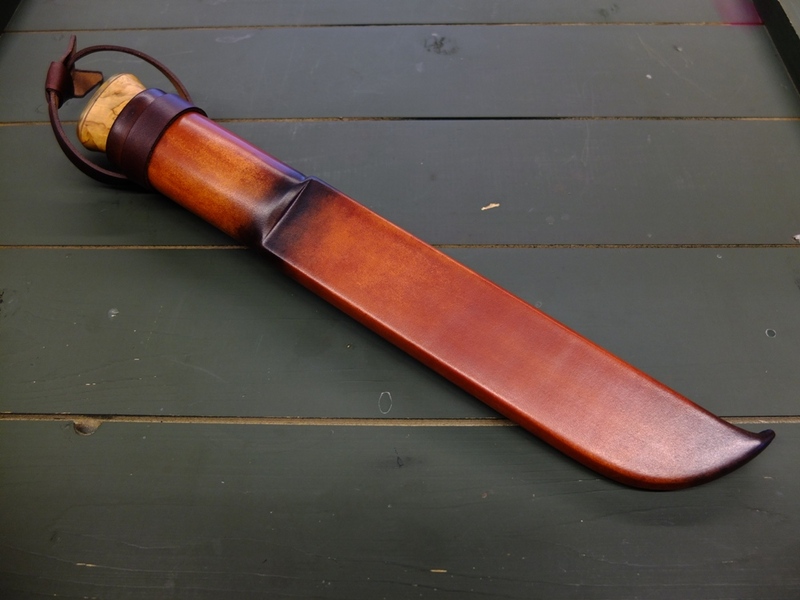 During my years in the mountains I carried a Sami type knife belt with two knives, one normal sized Sami knife and one “huggare” also called a chopper or Leuku. 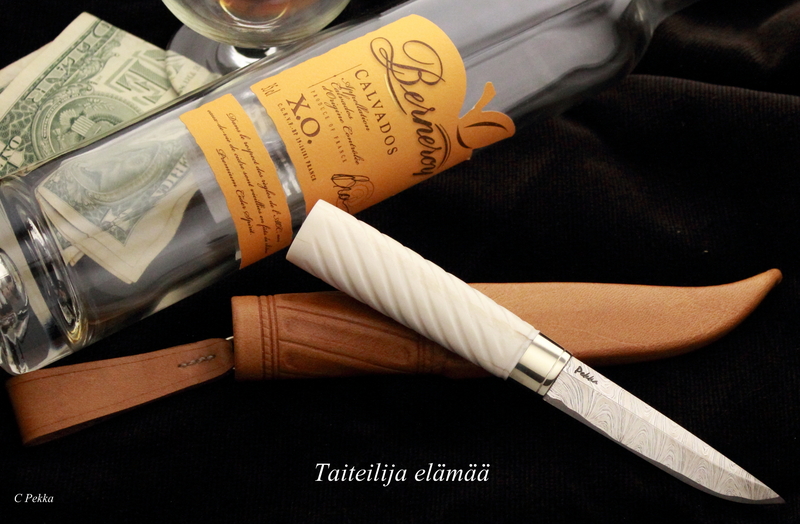 Leuku is a Finish name for a huggare and it is used only in Finland. 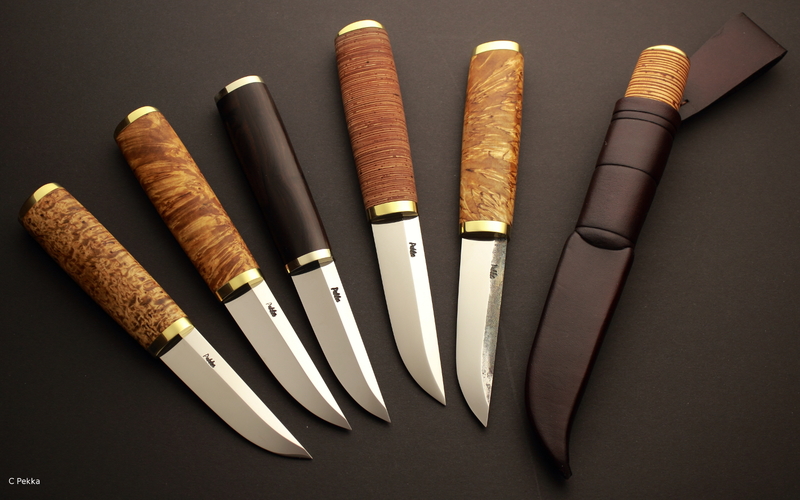 They also are named “Lapphuggare”, Sami chopper in Sweden and Norway. 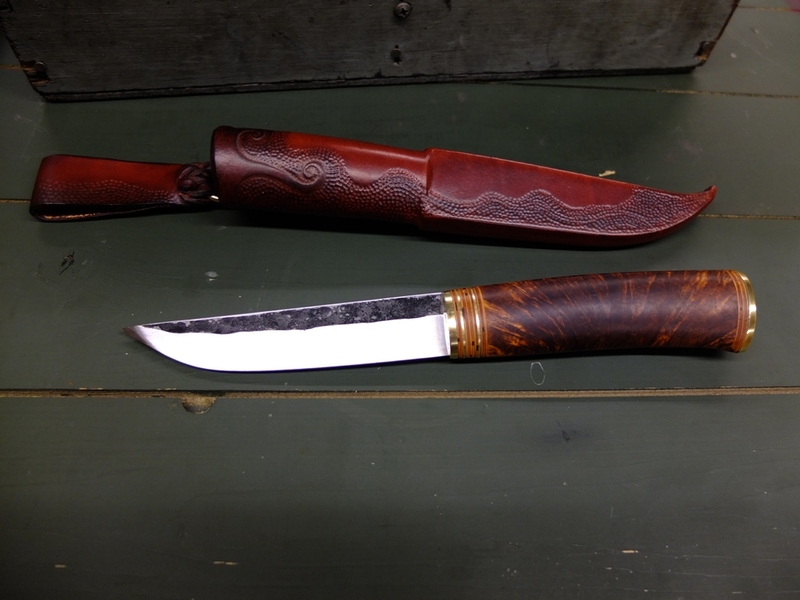 The chopper is a working knife, made for hard work and I have used choppers a lot in my life – and I still do, but now I do not make shelters and so on – I walk home instead to a warm fire, a good whisky and a loving wife. That is much more comfortable in my age. 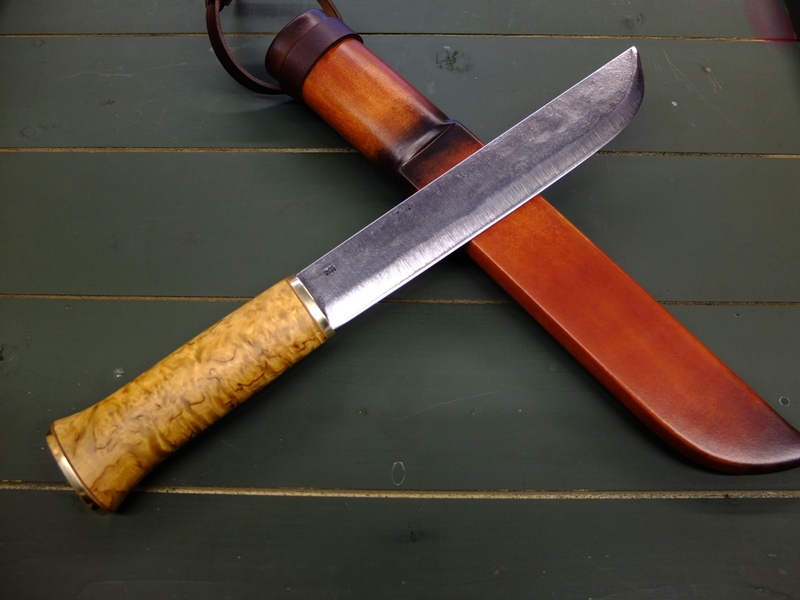 Choppers, leuku or huggare is a very special type of knife, it is not just another knife. It is designed for arctic use by a nomadic people. Every part of the complete knife is designed for just this. 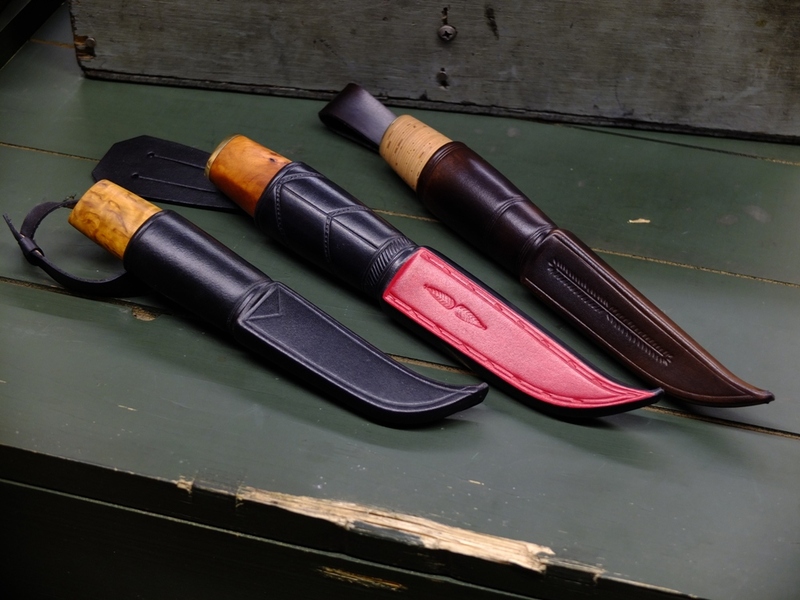 I know that today’s knife makers make their own design of them, but in my mind, those knives are not a huggare, it is something else. Perhaps a sort of Bowie? 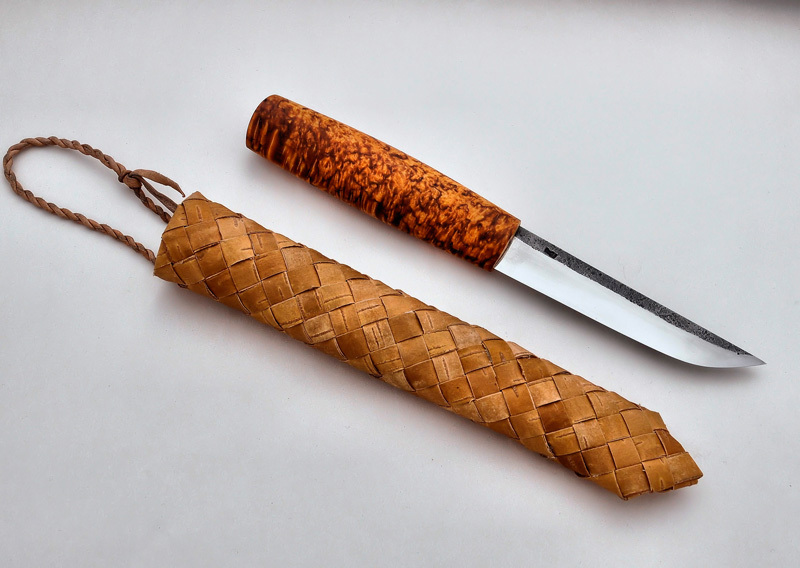 A leuku, as all old traditional knives, are designed from the need of them in first hand, and then from the real using of them during a very long time. Every generation changed the leuku’s basic design so it functioned a little better, until there was no reason to change it any more, the function was 100% effective. That was some hundreds of years ago. There is many reasons behind the design we see today on a “standard” leuku. It is a 100% functional design for what it shall perform in just that climate. 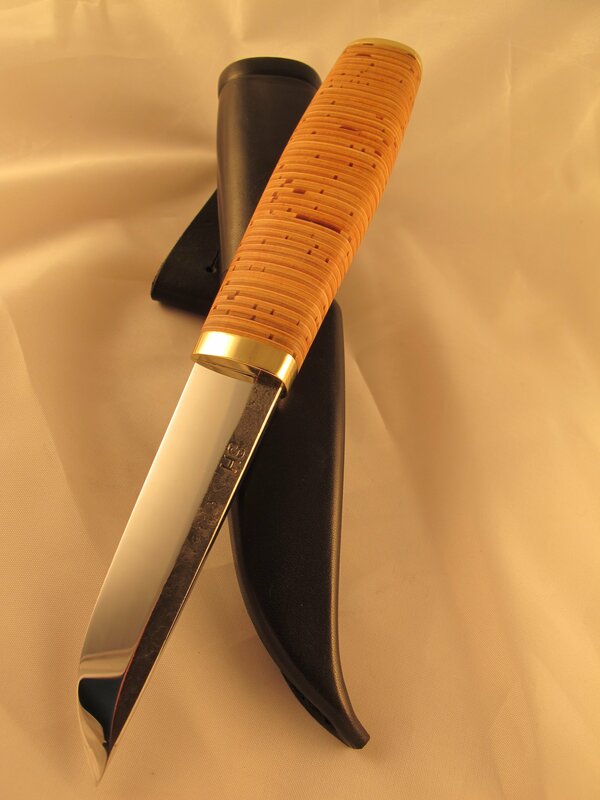 The balance, the blade length, the handle material, the knob – every small detail is important for its use. A good huggare shall have a big knob on the handle. 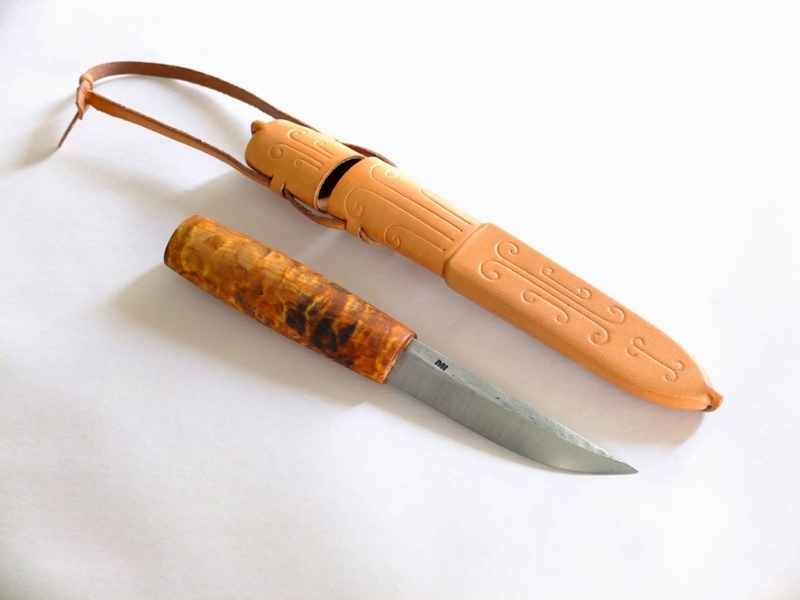 It is necessary in the arctic climate and this knob is used in many ways depending on what I am chopping, big branches or small branches birch or pine branches – or if I split wood, or build a shelter. Sometimes I hold my chopper just with the little finger and let the rest of the handle slide inside my hand and all the rest of my fingers just steer the huggare so I hit exactly what I like to hit. 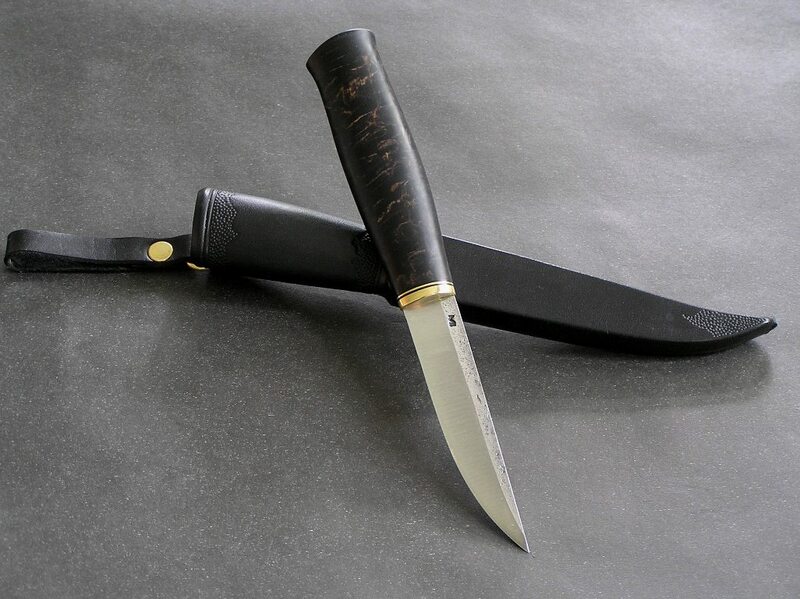 For example tiny branches in a bush, and for that job the knob is very important, if there was no knob the knife will slide out of your hand, especially when it is wet and cold and during the winter. And of course, when you have chopped like that for 2-3 hour your hand will be very tired. No metal pieces on the handle in the arctic climate, that is very important when the temperature goes below minus 30 centigrade. I hate thin blades that “vibrates”on huggare. 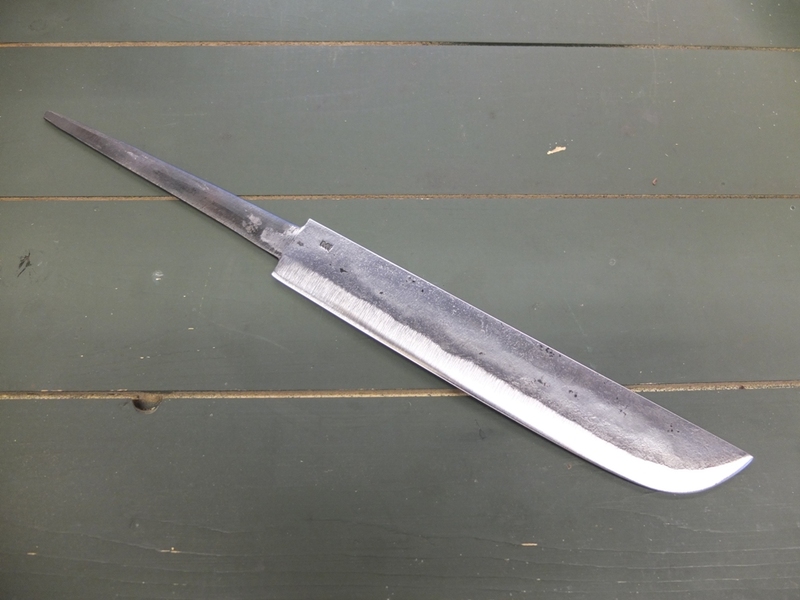 That is why I make my own huggare, 5 mm thick blade, 20-22 cm long blade, about 25mm wide blade, convex edge in about 26-30 degrees, and it works like a dream, at least for me. 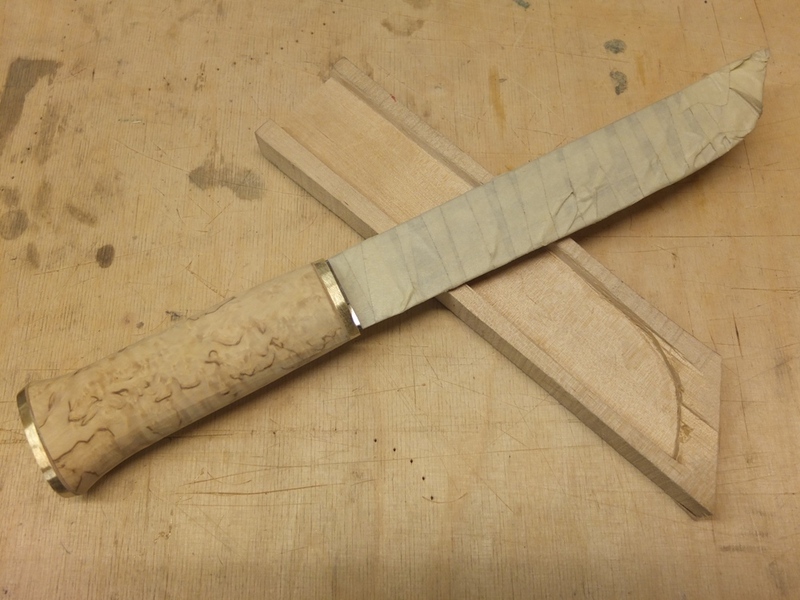 When living with knives as your only tools, you see what happens to the edges during time. 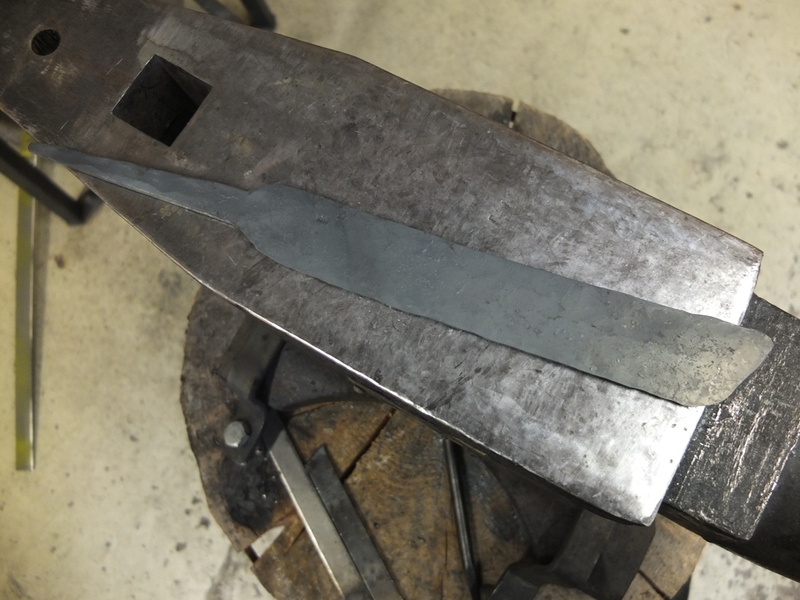 Years ago I started to think about a sort of sharpening tool that will give a locked angle – and when I became older I had the time to construct tools from those thoughts. Today that is EdgePal sharpening tools and you can find them on my homepage: http://www.edgepal.com/ where there is also a page in English. 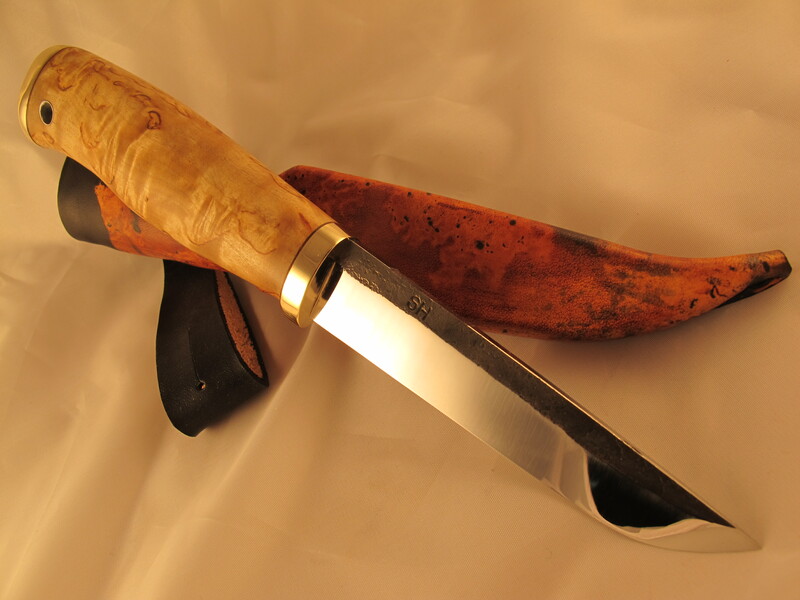 Thomas’s leuku, huggare, or chopper.